In the past 9 months, I have been “promoted,” as it were, up the ladder of success in AA. In the first weeks in the program, I was a seat warmer/listener at meetings. This is a legitimate position, because I was at least committed to attending the meetings every day. As time marched on, I advanced to what I will call “reluctant sharer,” where I would raise my hand with no belief that my words meant anything to anybody, especially myself. After 90 days, it was strongly suggested I take another promotion, and I chaired my first meeting. Not too long thereafter, I was asked to share my story, and thus became the speaker of the meeting. Then there was a period of relative calm, during which I began to develop a little more confidence, and realized that my experience could be meaningful to others, and so I advanced from reluctant sharer to, maybe I won’t say confident, but at least more relaxed sharer, at meetings. At this point I was introduced to a group of people who had just opened a new club house located about 5 driving minutes from my home. Several people in the group encouraged me to start my own meeting, which I at first dismissed out of hand… who would come to a meeting run by me? What in the world do I have to offer? But as I continued to get to know the club house, and its members, the idea had taken root, and I started seriously considering it, and talking about it with members of the Fellowship. Finally one of the women said to me, “you’ve been talking about it long enough, now it is time to just do it.” It still took several more weeks of waffling, but I finally turned in my paperwork and gave a date of my inaugural meeting… October 29, 2012. And now I feel like I am in a whole new stratosphere of AA. Creating flyers, researching, marketing, and, most fun of all, creating the format, printing readings, organizing binders, I am really getting excited for the day to arrive. Of course, I am so nervous… I was reading through a sample format that has the secretary of the meeting pass off the reading to chairperson and I laughed out loud… currently I am the chairperson, secretary, and sole member of this meeting! But I feel like I have done a decent job in my first attempt at sales and marketing, I’ll just have to wait until Monday to see if my hard work pays off! Wish me luck, and I will be excited to give a follow-up to this post! Of course, this list could go on and on, but you get the general idea. If I could do all of this in 9 short months, imagine what miracle is around the next corner? So I recently told an addictions counselor this strategy, and she was very quick to disagree. She believes that a person should have 2 years of sobriety before they are qualified to sponsor another, and she was quick to caution me not to jump into the role too quickly. This advice was given on a Friday, and the following morning I had a commitment to chair a topic meeting, and so, in the spirit of making things all about me, I chose the topic of sponsorship, and elicited the group’s feedback. In the course of my side of the discussion, I shared a story of my earliest sponsor in the AA program, who, long story short, had only 8 months of sobriety, and, to put it in the nicest way possible, had absolutely no business offering to sponsor me or anyone else. I severed those ties over a year ago, and since that time she had left the program (the AA world is a small one, and I had been given this information from several sources). But my point in sharing this story was… am I equally unqualified to be a sponsor, since I have only a little more time than she did? Fast forward one day, and the meeting that worked out best for my schedule fell at 2:00, in the same location where my Saturday meeting was. I am pretty well-known at this place, and I will be starting a meeting of my own there next week (a topic for a different post). So I went to pass out my flyers and to see if there were any newcomers I could talk into coming to my meeting. Well, there was one person new to the meeting, and three guesses who it was… you got it, the crazy first sponsor that I haven’t seen in about 15 months. To say I was uncomfortable during that meeting would be a gross understatement, I haven’t felt like that in a really, really long time. She presented herself as though she had never left the Fellowship, and, since it is not my place to judge, I will refrain from comment. I attempted to have a conversation with her, she was dramatically dismissive. Again, I will refrain from the comments I would like to spew out. Since I still had another amends on deck later that afternoon, I did my best to put the situation out of my mind, and I went about my day. This week, my goal is to get to as many different meetings as I can in an attempt to do a media blitz for the meeting I am starting. I go to one today, and once again, this woman is at the meeting, and this time she is making announcements for the place where I am starting a meeting as if she is the CEO of the organization (alright, that might have a little commentary in it, I am only human). So now I am left to wonder… why, why why?!? Is God putting her back in my life just as I am starting my amends process for a reason? Certainly, I owe her an amends, if for no other reason than I was less than communicative when I severed the ties, but this is truly a case where her wrongs far outweigh mine, and, sorry, but there are way more important people in my life to whom I owe amends than to her. But I just can’t ignore the signals here… she is back for a reason, and I guess she will keep surfacing until I figure it out. Sorry for the long post, I am trying to work this out as I write, I welcome any feedback! Steps 10 and 11: How the Steps Are Ruining Me! It still blows my mind that I am a person who has completed 11 of the 12 steps of recovery. As I mentioned yesterday, steps 10, 11 and 12 are considered maintenance steps, in that they are to be practiced daily for the rest of my life. Step 10 is more or less a “spot check” inventory, to be completed at any time of the day, particularly if I am feeling off-kilter. Step 11, as it has been explained to me, is to be done nightly, where I review the day, take note of things done well and not so well, and asking God to help me take whatever corrective actions I might need to take. Mini-confession: I have heard much about step 11 in the past 9 months, people in meetings speak often of the importance of praying first thing in the morning, and then again right before bed. I have long been in the habit of getting on my knees each morning and thanking God for another day, but by the time I am ready for bed I am usually very ready to go to sleep, and really enjoy drifting off to the sounds of whatever sitcom happens to be playing on TV (30 Rock is my favorite). So, every time someone mentioned the idea of night-time prayers, I pretty much said to myself, “I’m not at step 11 yet, no need to rush things.” I guess that thought’s out the window! So, for the past couple nights, I began the ritual of reviewing my day. To my astonishment, I have been given a gift. I have found that in reviewing my day, I have been very pleased (so far anyway), which is an absolute miracle in and of itself, since I have been known to be a little hard on myself. Of course there are always things upon which I could improve, but the good far outweighs the bad, and I am filled with even more gratitude for the life I am leading. Last but not least, here’s what I mean by the steps ruining me: I find myself unable to just say whatever I want anymore, because now I know I have to review it at day’s end, and I simply don’t feel like making yet another amends! This whole personal inventory thing is killing me! Last night I completed steps 10 and 11, which means only one more to go, and I will have officially completed the 12 steps of recovery! And yes, my friends in the fellowship, I do know that means I have not graduated. I think of it more like Weight Watchers… 10 and 11 are the maintenance program, and with step 12 I am a lifetime member. As someone who, in the past, joined Weight Watchers more times than I could ever count, it feels like a HUGE accomplishment to be in the maintenance program of anything (I was insanely jealous of those people who had the special colored weigh-in cards and did not have to pay their weekly fee!)! I must add, for the record, that step 9, making amends, is a process, and I have continued my step work even though I am not through making my amends. Depending on individual circumstances, making amends can take years, and it would not be efficient to stop step work until you are completely through step 9. I was required to complete 2 amends before advancing to Step 10. My original thought was saving my husband for last, but when I realized how long the process could take, I decided to “do” him first (sort of like movie credits, the most important actor is listed either first or at the end with an “and” in front of the name). As long as I was getting important ones done, I asked my Mom if I could also make my amends with her. Here is what I think about Step 9, now that I have officially done some work on it: it is painful!. The worst part of the whole thing is the preparation for it, because I am once again reliving the horrific mistakes of the past. Second worst is the wait time between preparing for and actually sitting down to do the amends. Because I live with my husband, and because I have procrastination in my blood, I put this off as long as I possibly could (seriously, I did both amends the same day I was scheduled to meet with my sponsor for Step 10!). During those few days, any of which I could have sat down and done it, I did not sleep well, had a hard time making eye contact, and was generally pretty crabby. The actual process itself is not quite as painful as the prep work, but by no means is it a party. Luckily for me, with both amends I completed, I was dropping no bomb shells, and I had a pretty good feeling that both amends would be accepted. There was some painful feedback, but it would have been weird if there wasn’t, and by the end of both I felt a tremendous sense of satisfaction that it was DONE! My greatest fear in making amends, particularly with my husband, was that I would re-open some pretty fresh scars, and that by doing what I needed to do for my recovery, I would in fact be hurting him. Thankfully, this did not seem to be the case, and with both amends I was able to spend “normal” time afterwards, and it really was normal. Such a blessing! This post is going too long, I was really going to write about Steps 10 and 11, I guess I will save that for tomorrow! Having the patience to make this, enjoying the family who helped me create it, and watching the joy on my son’s face as he saw this, are just a few of the blessings for which I am grateful today. 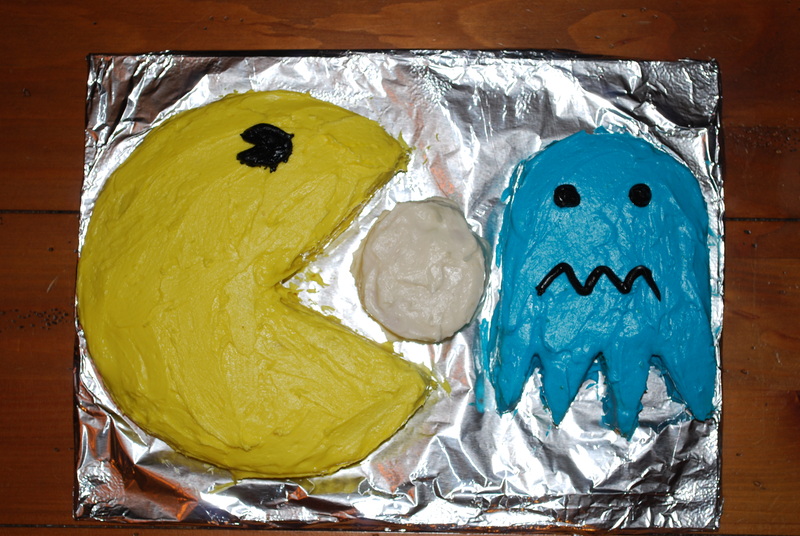 Today I am hustling and bustling getting ready for my son’s 10th birthday tomorrow (special requests include potato salad, chicken cutlets, and a pac man cake, thank God for the internet on that last one!). First thing this morning, I came into some knowledge that had my character defect of self-righteousness on high alert… I believe I am a victim of some injustice, and nothing gets me more irate than when this happens. To complicate this issue, I have no ability to find a resolution for about a week, which only heightens my angst. One year ago today I was preparing to enter an inpatient rehab. I convinced the family member instrumental in enforcing this decision that it would be best to wait until the day after my son’s birthday, so as to minimize the disruption to his life. I had been “caught,” for what felt like the millionth time, violating my promise to stay clean and sober 5 days prior to his birthday, and the ultimatum had come in… get some help, or get out. I chose the former, and we spent the next few days figuring out rehabs, insurance acceptance, and attempting normalcy around the children. We had the extended family over for cake and ice cream, and no one was the wiser, which simply added to the stress of the situation. You know what 4-5 days of waiting to go into rehab is like? It is like a form of hell on Earth. And trying to pretend to the world that all is well makes it that much harder. Okay, that’s enough of the sad stuff. Fast forward a year (thank the Good Lord I am able to do that! ), and here I sit, typing a blog to family, old friends, and new ones I haven’t even met but who inspire me daily. I am able to plan all sorts of neat ideas for my son to enjoy, and I am appreciating the opportunity I have to do so. I am a week away from celebrating 9 months of continuous sobriety, something I had only accomplished in the past when I was pregnant. I am actively involved in a 12-step program, getting ready to finish the steps, and looking forward to passing on the message to others. I have begun the process of starting my own meeting, and am actively recruiting attendees. I am involved in a legal program that will ultimately allow me to wipe my slate officially clean. What in the hell do I have to complain about? Okay, I feel much calmer today, as I usually do once I understand what I need to do, and why I have to do it. Here is what I learned: making amends is important, because it allows me to wipe the slate clean, once and for all, in terms of the wreckage of the past. Step 4 (the personal inventory), allowed me to “get right” with myself, Step 5 (admitting to God and another human being) allowed me to “get right” with God, and Step 9 will allow me to “get right” with the world. Once completed, the remaining steps are more or less a maintenance program for the rest of my life… pretty cool stuff. A lot of the questions that I was frantic about yesterday got answered in the same way… trust the process, and give it to God. I believe trusting the process will be critical for me, as one who tends to intellectualize everything, and thus habitually believe I am falling short of my goal. I’ll tell you what, though, the minute I heard my sponsor say to me last night, “trust the process,” it felt like a weight was lifted off my shoulders. I simply have not been trusting this process enough, and when I do, I realize how effectively this process has been working for me. I get so obsessed about doing things perfectly, and all that anxiety gets me further away from my goal, rather than closer to it. Tonight I am meeting with my sponsor to start work on Steps 8 and 9. I thought it would be interesting to write my thoughts on these steps before I have any real education, if for nothing else than for comic value. So, here is what I know at this point about these steps. Step 8 is “make a list of all people we have harmed, and became willing to make amends to them all.” I imagine I will use my 4th step written inventory as a reference, but I already have questions about this list… haven’t I done harm to everyone with whom I’ve had a relationship? Do I have to write down the name of everyone I know or have ever known? To my current way of thinking, if my addiction has caused someone worry, then I’ve done them harm, so wouldn’t that mean everybody? Already this is out of hand, at least it is in my mind. And that’s just writing down a bunch of names. The real work begins with Step 9: “made direct amends to people wherever possible, except when to do so would injure them or others.” Of course, at this point all I can think about is the Seinfeld episode where George tries to demand an amends from his friend in recovery. Hilarity ensues, and the friend winds up relapsing on some rum raisin ice cream. Of course, this is silliness, but, of course, I do go there… what if there are a line of people impatiently waiting for me to get to this step? What if I go to apologize and they give me a laundry list of additional offenses? What if they refuse to accept my amends at all? And that is the tip of the iceberg about my concerns about completing this step. In early sobriety, I had begun writing in a journal in an attempt to track my rollercoaster of emotions. A few weeks into that process, a very good friend suggested that I should instead start a blog and share my experiences more publicly. My response was a polite but disdainful refusal. I believe I said something to the effect of, “there is no way I would do something as self-indulgent as that.” Her response was much more direct, and much less polite: “you have no idea what blogging really is and how can you be living in 2012 and not understand social media?” I am truly blessed to have friends who tell it like it is, because I did not understand blogging at all. So I created my membership at WordPress. At first, my posts were more or less a documentary of what was happening in my life, and how life can improve by staying sober and connected in a 12-step program. After a few weeks, I received a notification that I did not understand, and I had to ask my husband what it meant. He explained that I had a follower, which I then had to have further explained that she would now receive a notification every time I wrote something. I will not soon forget the feeling of astonishment that someone I did not know was regularly reading my thoughts. I was not kidding when I said I did not understand the concept of blogging. I then tapped into my keen logic, and realized that since people are following me, then perhaps it might be helpful (not to mention polite) to follow my comrades in the blogosphere (did I mention how bright I am?). The decision to follow other blogs has brought me such a wealth of experience, strength and hope, it is like having a 12-step meeting in the computer room of my home. As the months have gone by, and life has gotten progressively better, I have come to think of blogging as a necessary part of my recovery, something I have come to rely upon the way I rely upon 12-step meetings… I just do it, and I feel really good each time I complete a post. I realized yesterday that I have reached a new stage in my blogging career. Not only do I get a sense of satisfaction out of completing a post, not only am I rewarded with things like “likes” and insightful comments from friends and followers, but now I am actively using this community to guide with me with life issues. Yesterday I wrote about a problem, and yesterday the problem was resolved in multiple, useful ways with people whose opinions I have come to respect, although I have never met them personally. The feeling of community I am experiencing is mind-blowing for someone who, 6 short months ago, believed blogging was a bunch of self-indulgent tripe! So, to sum up, I would like to express my heartfelt gratitude for all the positive support, and all the spot-on advice I have received. I truly appreciate all of these gifts, and I will do my best to pay it forward.